This past Friday I had a great opportunity - my wondeful friends, creators of Palermo based cultural association Flowerful Embrace, invited me to participate in a fashion show. And not just an ordinary fashion - the traditional dress fashion show. It was the second time when they organised this type of a fashion show and both times it went great. I love the fact that it unites fashion, diversity and cultural richness and functiones as an amazing tool for social inclusion and cultural dialogue. I'm always up for trying out new things and saying yes to new experiences, so I had no doubts of whter I should participate. There was only one problem - when I moved back to Italy, I didn't bring a Ukrainian dress or even a shirt with me. I only have one, and it is a sort of a family heirlum, so I couldn't justify bringing it here with me, as I'm quite protective of it - my great grandmother made the fabric, my grandma embroidered it and my mom made the shirt. I believe I have a photo of it somewhere on my blog - from good old times, when I was still living in Kyiv and going to every possible ethnic festival. So the problem was the dress. 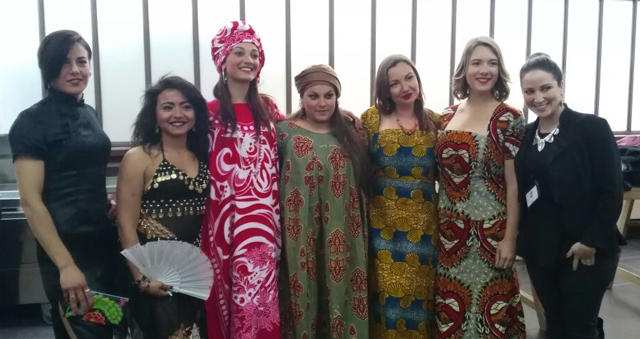 And Emilie, one of the organisers, brought us her clothes - amazing cotton dresses from Cameroon. So yes, I was representing Cameroon and it was great. If any of you will get the opportunity to do something similar - take my advice and go for it. It was so wonderful, empowering and also so much fun! I've been involved in many social projects over the years and absolutely loved all of them. We were revitalising street games with children from my city, collecting clothes for refugees in Thailand, organising exhibitions of art that was telling the stories of violence, bringing life back to the abandoned football field in a problematic neighbourhood of Palermo, and this is not the full list. I'm writing this not because I want to present myself as a big humanitarian, not at all. I actually enjoy all of this way too much so that one (me, for example) can say that my reasons, in the end, are purely selfish :) And I'm planning to be involved in social work as much as I can for as long as I can. Because doing something like this is not only important and eye-opening, but also is honestly very cool and a lot of fun! So I'm saying thank you to everyone who was involved and really looking forward to the next event of Flowerful Embrace, that will take part on May 18.